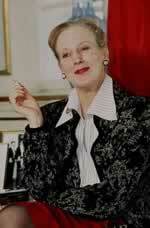 Home » Image Galleries » famous smokers » royal families » Margrethe II (Margrethe Alexandrine Þorhildur Ingrid), queen of Denmark. Margrethe II (Margrethe Alexandrine Þorhildur Ingrid), queen of Denmark. The chain-smoking Queen Margrethe of Denmark, who has been cruelly dubbed the "Ashtray Queen", has decided to stop smoking in public. The move has disappointed those Danes who saw the 66-year-old monarch as one of the last bastions against so called political correctness. But with the new law banning smoking in public buildings, the Queen had little choice. "You will not see the Queen smoking in public any more," Lis Frederiksen, the Danish court spokeswoman, said. Although the Queen was frequently criticised by anti-smoking campaigners, she had the press on her side. The other great Scandinavian smoking monarch is Carl Gustav of Sweden, although he has been hiding his packets and cigarette butts for years. By contrast, when Queen Margrethe was asked about her smoking problem, she replied crisply, "I have no problem", before promptly lighting up. Plainly the Queen does not want to fall foul of the anti-smoking organisations.